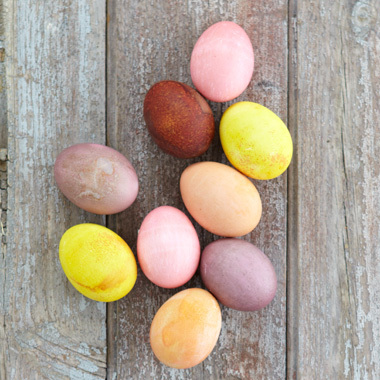 We’re just dying over these naturally dyed Easter eggs. Ha, dying. Get it? All puns aside, these Easter eggs turned out to be a beautiful and easy alternative to the traditional Easter egg dye kits. We hope you’ll give them a try and add them to your Easter baskets. Peel the skin of 6 red onions and simmer in 3 cups of water for 15 minutes. Strain the mixture and then add 3 teaspoons of white vinegar. Boil 3 cups water. Peel and cut 1 beet into chunks and drop in boiling water. Take off of heat and stir in 2 tablespoons of vinegar and let cool to room temperature. 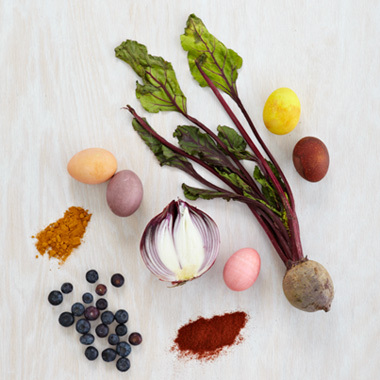 Remove the beets before placing in eggs. Combine 1 cup of frozen blueberries in 2 cups of water and let sit until the blueberries thaw. Remove the blueberries before placing in eggs. Boil 2 cups water and stir in 3 tablespoons turmeric. Take off of heat and add 2 teaspoons white vinegar. Boil 2 cups water and stir in 2 tablespoons paprika. Take off of heat and add 2 teaspoons white vinegar. To get the richest colors, we recommend soaking the eggs in the refrigerator overnight.